Saturday, April 13 | 9:30 a.m.
Join us as we make Palm Crosses to be handed out on Sunday to begin our observance of Holy Week. Easy to make and a joy to be in community. Our service begins with festival trumpets, the blessing of the Palm Branches and the story of Jesus’ triumphal entry into Jerusalem and ends the Passion narrative of Jesus’ betrayal, abuse, and crucifixion. New this year the Passion reading will include visual images of Jesus’ journey to the Cross prepared by Youth of St James. You are invited to a simple supper and fellowship in reflection of Jesus’ Last Supper. After, worship together in a somber service including the stripping of the altar as we prepare for the mystery of death and resurrection of Easter. Children aged 3-12 journey through a sensory experience—smell the Garden of Gethsemane, feel the weight of cross, and hear the ripping of the veil at the Temple. This is a great event to invite friends to—it’s active, but also represents an important aspect of our faith and ties children to our values as Christians. Join us for a service of hymns, readings and prayers reflecting on the suffering and death of Christ. Gather by candlelight around the cross with Taize music and prayers for the world. Joyfully celebrate the Resurrection of Jesus! An Easter Egg Hunt follows the 10:00 a.m. service. Saturday, April 13 | 9:00 a.m.
﻿Monday, April 15, 29 | 1:00 p.m.
Tuesday, April 23 | 7:00 p.m. Meditation is a practice of beginning again and again. God invites us to sit still in open presences as we are. When we sit, we learn to be gentle and generous like God. We learn to soften to our distracted selves and find the place of true rest under the surface. Residents of The Grove sometimes arrive with only the clothes on their back. We can be the hands and feet of Jesus by donating new or gently used clothing. Most needed are elastic waist pants, zipper or button down shirts, sweaters, sweatshirts, t-shirts and socks. Please drop items off in Ron’s old office. All sizes for men and women, especially larger sizes, are needed. Clothing must be able to be washed in hot water. Godly Play is offered for children aged 3-12 years old. Godly Play is a program designed to expand a child's spiritual identity through storytelling. During Lent, we will be adding additional programming to our Godly Play schedule to appeal to our older children (ages 8-12). Each week will have a directed response (activity) that children will take part in. Children and Youth of all ages are welcome to join us for the story and directed response. Sunday, April 14 | 11:30 a.m.
Children ages 8 and up are invited to participate in Sewing Club. Learn the basics of sewing with experts, while making items for Days for Girls and Quilts Beyond Borders, which serve women and children around the world. Friday, April 19 | 9:00 a.m. - 12:00 p.m.
Children aged 3-12 journey through a sensory experience--smell the Garden of Gethsemane, feel the weight of cross, and hear the ripping of the veil at the Temple. This is a great event to invite friends to--it's active, but also clearly represents an important aspect of our faith and ties children to our values as Christians. Let kClare know you are coming! 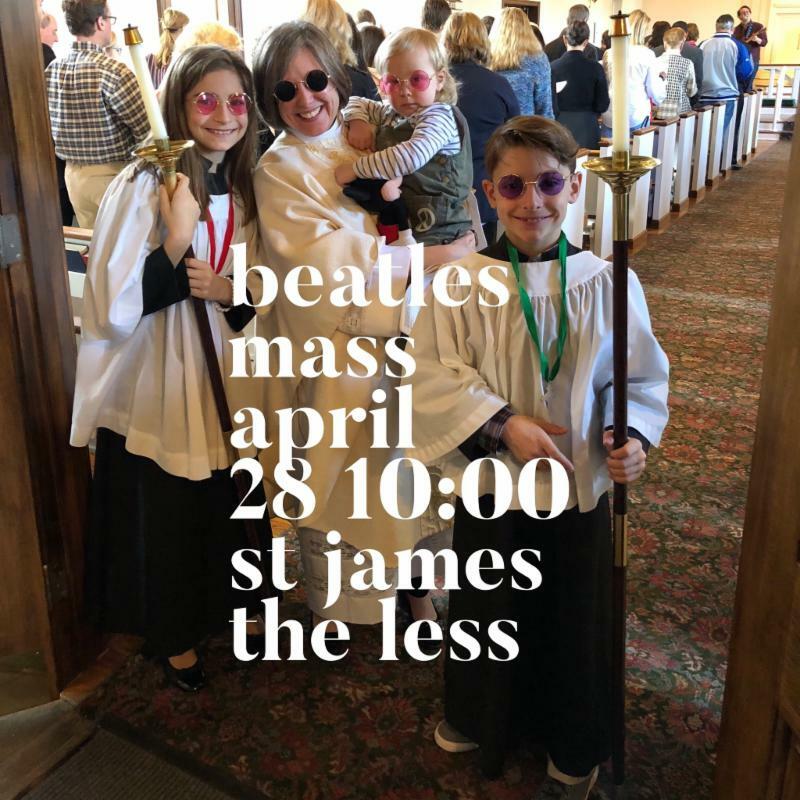 Over the past five years, our Beatles Mass has grown to become the most successful fundraiser for our Outreach ministries. Equally important, it has become a very successful invitation to people to visit St. James the Less. This year, our Beatles band will be back, we will serve a delicious brunch, and hold our silent auction. We need your help with donations for the brunch and silent auction. Letters were mailed this week, and are available in the parish hall as well, with details about your participation! To date, we have pledges in hand which will cover 73% of our budget for 2019. 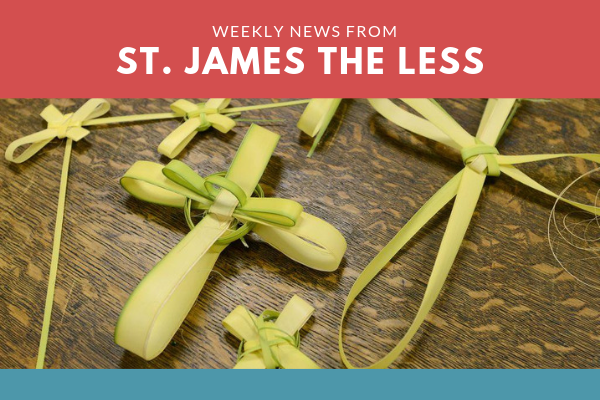 If you have not already made your pledge to St. James the Less for 2019, it would be a help to us in our planning if you would do so. We pray for Congregations in the Elgin Deanery: St. Simon in Arlington Heights; St. Michael in Barrington; St. Mark in Barrington Hills; St. Martin in Des Plaines; and in our Companion Dioceses of SE Mexico and Renk, South Sudan for San Andrés in Veracruz; St. Michael in Paloch. We pray for Bishop Todd & Rev. Patsy McGregor that they might be strengthened, renewed and refreshed on their sabbatical. We pray for all the clergy and people of the Diocese of Toliara, Madagascar, especially for Assistant Bishop Sami and his wife, Holy, during Bishop Todd’s sabbatical. We pray for those struggling with food insecurity. O God, the strength of the weak and the comfort of sufferers; mercifully accept our prayers, and grant to your servants the help of your power, that their sickness may be turned into health, and our sorrow into joy; through Jesus Christ our Lord. Amen. O God of grace and glory, we pray to you for those we love, but see no longer. Grant them your peace; let light perpetual shine upon them; and, in your loving wisdom and almighty power, work in them the good purpose of your perfect will. We thank you for giving them to us to know and to love as companions on our earthly pilgrimage. In your boundless compassion, console us who mourn. Give us faith to see in death the gate of eternal life, so that in quiet confidence we may continue our course on earth, until, by the call, we are reunited with those who have gone before; through Jesus Christ our Lord. Amen. Merciful Lord, fill my heart with compassion and love, as I strive to become someone who forgives and embraces rather than someone who clings and condemns. Amen. We invite you to join the Prayer Network which receives email notifications and prays for needs as they are shared with us. Contact Sue Babbs for further information.